The Varnished Culture viewed the first episode of this pilot series about a passionate, caring, fast-talking, salt-of-the-earth, working mother who drives a pristine, beautifully restored, maroon Valiant Charger (why?) and is either a fearless suburban solicitor or a high-flying barrister – it’s hard to tell. In considering this wafer-thin yet impenetrable show, we had recourse to Newton’s famous physical laws. Newton’s Third Law of Motion: A body exerting force on another meets a simultaneous force of equal magnitude. 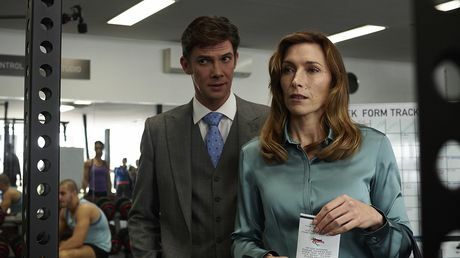 Josephine Newton (a reasonably engaging Claudia Karvan) briefs a drunk for a bail application, has her office torched by the pyromaniac client as revenge, and is persuaded by smarmy, oleaginous, top-end-of-town ‘silk’ Lewis Hughes (Toby Schmitz) to join blue-blooded Knox Chambers as a member of the independent bar. Apparently one can do so, just like that. So whilst Newton has to immediately sack loyal assistants Helena Chatterjee (played by Georgina Naidu as someone straight from Goodness Gracious Me) and lovable loser Johnny Allbright (Sean Keenan as a dumbed-down version of Brice’s mate from The Fast Lane), she will still invest large chunks of life ensuring they find their feet. As the promotional blurb justly states: she has “an overdeveloped sense of responsibility.” That includes putting-up with passionate, caring, environmental activist ex-husband Callum (fresh from Borneo), pill-popping slattern Rose and 15 year-old daughter Lydia (she may not be called Lydia – by the time she appeared TVC had developed a drinking game, and attention wandered a little). So this admirable Crichton goes to the heart of the big city to take up space in chambers and get to work on a big, juicy murder case. But wait: there’s a peg – the tiny room she occupies was that of a former barrister who fell from the roof of the same building, the alleged murder victim of another lawyer also wanting to camp at Knox, whom she is defending! Coincidence? I think not. And so the 3rd Law of Motion is again vindicated: when dross meets drivel, they combine and form a gigantic piece of tosh. Nowhere in this thing is any sign of subtlety or credibility. Nothing is a surprise. Even the anachronisms, depressingly, are predictable. A Magistrate states: “This is highly irregular” (True). Bail is granted because “it pays to be well connected.” When counsel head up the steps to the Supreme Court, it looks suspiciously like the Victorian Parliament House. Hearsay and speculation abound, and there are montages of counsel passing law books back and forth (to what purpose is unknown). The crusty prosecutor is only slightly less outrageous than Raymond Burr’s court-room act in A Place in the Sun. (The comparison is apt, for this fluff is the type of thing they were making in the 1950s.) All bearing-out Newton’s Law of Universal Gravitation, that a drama attracts a comedy in the universe using a script that is directly proportional to the product of their talent and inversely proportional to the square of the distance between them and the wretched audience. God knows which members of the legal profession gave technical advice to the producers – one assumes it was disregarded in the interests of something or other. Did I mention that Newton of counsel occupies the room of the barrister who tumbled off the roof above? Oh yes, I did, but not the fact that nobody thought to go through his things, conveniently arrayed near Josephine’s desk. And look! She turns up a treasure-trove of hitherto undiscovered clues, documents that will vindicate her client once she hunts-down the deceased’s disabled son (the type of unfortunate too low to interest the police, the prosecution, her colleagues, etc.). And by putting documents to a dramatic, last-minute witness, through whom such documents could not be admitted in a real court of law, and delivering a homily (of awesome triteness) to the jury, Newton wins the day! Champagne for everyone! Just enough time to blackmail the snooty head of chambers (Andrew McFarlane, borrowing heavily and shoddily from certain types in Rumpole of the Bailey) to stump-up compensation for the unlucky son, and to rent a shed in the underground car park for the new firm of Chatterjee & Chatterjee. Thereby satisfying Newton’s Second Law of Motion, that the velocity of a bloated, tired and lustreless comic drama is equal to the mass of indifference it evokes, multiplied by the speed with which it shall disappear from our minds. Newton’s Law is all mono-think, all contrivance, all dog from tail to snout. Karvan is likable enough but her character is totally bland and insubstantial. Everyone else is a caricature. It’s touted as the Upstairs, Downstairs of comedy dramas. Alas, it’s closer to Shaun Micallef’s skit show “District Attorney Ferguson” – without the laughs. Finally, we come to Newton’s First Law of Motion: In an inertial reference frame (viz., the ABC) an object remains at rest or moves at constant velocity unless acted upon by force. Applying that law, we predict that this series will not extend beyond the 8 episodes already in the can. Market forces (which apply even to the Australian Bolshevik Corporation) will bring this melange to a dead stop, sometime soon.